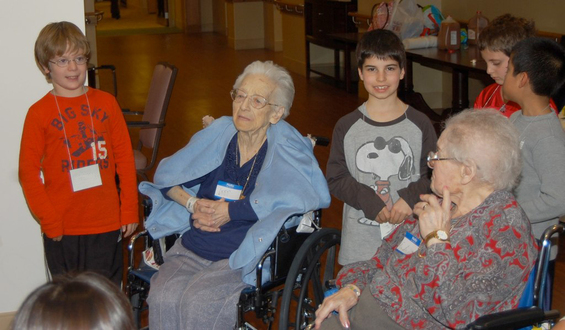 Jacob is a Rashi Mitzvah Maker, one of a group of students in grades 2-6 who voluntarily spend an hour each month visiting with residents at NewBridge on the Charles, the senior community with which Rashi shares a campus in Dedham. Mitzvah Makers is part of ongoing multigenerational activities at Rashi, which include Middle School memory support and gardening electives that bring students and seniors together, and family activities that unite the Rashi and NewBridge communities. Children are empowered to shape their Mitzvah Maker experience. At monthly lunch meetings, they discuss what they have learned from their last visit and plan the next one. In December, the children decided that for their Chanukah visit, the activities would include singing songs, playing dreidl, and engaging in a getting to know you scavenger hunt. Although the visit is structured, there is also room for spontaneous activities, such as serenading a NewBridge resident on the occasion of her 101st birthday. “The Mitzvah Makers program brings an enormous amount energy and joy to our residents,” says Julie Wade, Life Enhancement Leader of the NewBridge Health Care Center. “The positive emotion and power that fills the room leaves everyone involved filled with a sense of pride, giving, love and appreciation for one another. “The Rashi students demonstrate remarkable respect, curiosity and commitment to meeting the residents and having them fully participate. They overlook their illness and physical impairments and accept the residents for who they are,” Wade added.